Click the Program command on the Options menu. Right-click the task tray icon and select the Program command from the Options submenu. Click the Program tab in the Options window after it has been displayed by using one of the other commands in the Options menu. 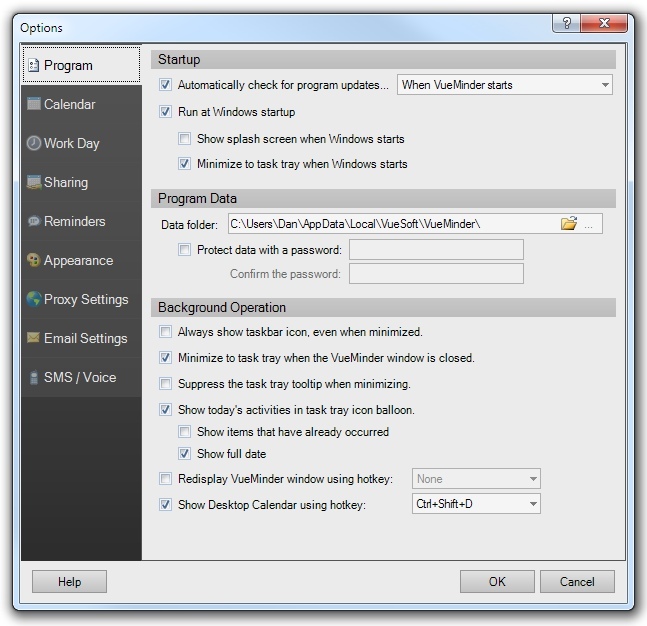 The Program tab of the Options Window enables you to specify VueMinder program options. You can choose to have VueMinder automatically check for updates when started, daily, weekly, or monthly. 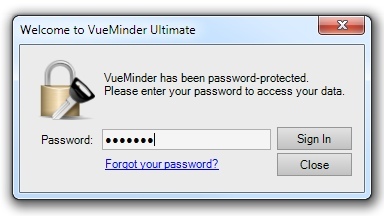 If a more recent version is available, the VueMinder Updater window will be automatically displayed, assuming your firewall doesn't block VueMinder from connecting to the internet. You can also manually check for updates using the "Check for Updates" option of the Help menu. Note, when VueMinder checks for updates, nothing is transmitted from your computer. A program version file is read from the VueMinder website, and the latest version number indicated in the file is compared with the version number of your current installation. By default, VueMinder runs automatically when Windows is started. It will reside in the task tray until a reminder comes due or you want to see the main window. If you prefer VueMinder to not start automatically when Windows starts, you can disable this by unchecking the "Run at Windows startup" box. Power users can also control startup by running "msconfig" and clicking the Startup tab. You can still manually command VueMinder to run via the Start menu or Desktop shortcut (if installed). You can choose to show the VueMinder splash screen when VueMinder starts during Windows startup. The splash screen is displayed when manually commanding VueMinder to start but is hidden by default when Windows starts. It displays time remaining to load as well as random tips and tricks for getting the most out of the program. By default, VueMinder runs in the background and is minimized to the system tray when Windows starts. 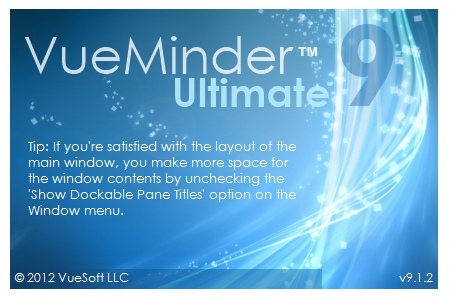 If this option is unchecked, the VueMinder window will display at its previous size and location when Windows starts. Options are provided for changing the data folder and adding password-protection. The default data folder will depend on the version of Windows and your login name. To change the data location, type in a new path or click the "..." button to browse for a path. After selecting the new path, your data will be saved at the new location. To open the current data folder, click the folder icon on the right side of the text field. If you prefer an added level of security, you can password protect your data by checking the "Protect data with a password" box and then entering the desired password. When this option is enabled, a password must be specified when the program is started. Otherwise, the program won't load. The password is encrypted (256-bit) and embedded within the calendar data file, so attempting to copy the data to some other computer and load it from there will still result in the password prompt appearing. If you forget your password, you can request a reset, but will need to have purchased a license so your identity can be confirmed. Also, if you later decide you know longer want a password, simply go to the Program Options and uncheck the password box. Note: For security, the current password will need to be re-entered before it can be changed or removed on the Options window. These options enable you to control how VueMinder behaves when running in the background. When this option is enabled, minimizing the main window will result in the VueMinder icon continuing to appear on the task bar, as it does when the main window is displayed. When unchecked, the task bar icon will be hidden and the only indication VueMinder is running will be the task tray icon. By default, when the main window is closed via the Exit command from the File menu or clicking the X in the upper-right corner, VueMinder will minimize to the task tray and continue running in the background. If you prefer the program to fully exit rather than minimize, you can uncheck the "Minimize to task tray when VueMinder window is closed" box. When the main window is minimized the first time, a tooltip balloon will appear explaining how to access the main window again. Check the "Suppress the task tray tooltip when minimizing" box to prevent this notification from appearing. 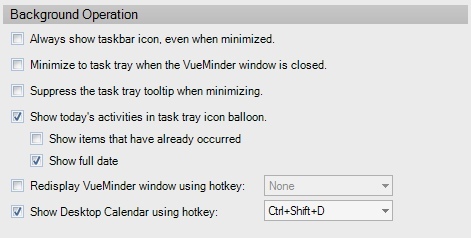 When the mouse is hovered over the VueMinder icon in the task tray, a popup balloon show today's activities. The popup balloon will also appear after VueMinder is started. This option can be enabled or disabled. There are 2 sub-options to control the behavior of the task tray popup balloon. You can control whether items that occurred earlier in the day are shown by checking or unchecking the "Show items that have already occurred" box. The "Show full date" box can be used to control whether the first line of the popup shows the full date or simply "Today". Since the popup is limited to 270 characters (a Windows limitation), unchecking these 2 sub-options will enable more activities to fit in the popup balloon. If the program has been minimized to the task tray, you can quickly restore display of the main window by using a global hotkey. There is no default hotkey assigned, but this can be changed by enabling the option and then selecting a hotkey combination from the drop-down list. A global hotkey can be assigned to minimize all open windows and show the Desktop Calendar. 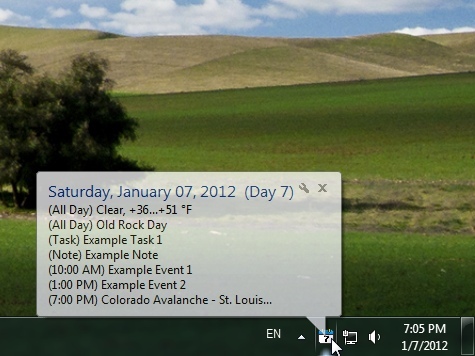 This is similar to the "Show Desktop" command provided by Windows, but doesn't inadvertently minimize the Desktop Calendar. There is no default hotkey assigned, but this can be changed by enabling the option and then selecting a hotkey combination from the drop-down list.